Sequins, taffeta, and jeweled tiaras filled the Chicago Improv…and that was just in the audience. 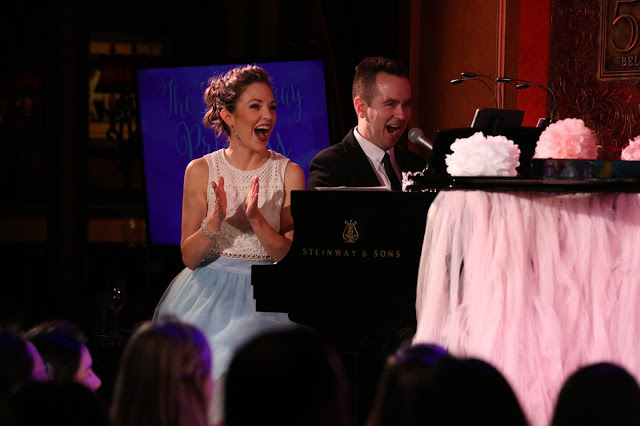 On stage Laura Osnes (Cinderella on Broadway), Susan Egan (original Belle in Beauty and the Beast) and Courtney Reed (original Jasmine in Disney’s Aladdin) were joined by Music Director/Fairy Godfairy Benjamin Rauhala to host a Broadway Princess Party. Through two sold-out performances, these talented artists performed the most beloved ‘Princess songs’ of stage and screen, reminiscing about their favorite fairy tales and most cherished characters. He approached Osnes (who was then playing Cinderella on Broadway) at his birthday party and asked her if she would like to do a show about Broadway princesses. She said yes. Then a few hours later, Osnes presented Rauhala with a spreadsheet listing of all the Broadway princesses (and her friends), along with their headshots and the specific princess she wished each to play. There were 14 names on the list and all agreed to do the show.